For the past 20 years, the NS Dutch national railways’ double decker trains were their work horses. Now it is time to replace them, but what to do with the old models? Recycle the parts and use them to modernise the rest of the fleet. The old NS double decker train fleet consists of 416 wagons, each weighing 60,000 kilos. This is a wealth of raw materials for the company to use to modernise other outdated trains. Thus making it possible to extend the lifecycle of the trains by 20 years at a lower cost. As well as being sustainable and rewarding, this project requires no subsidies. NS gives a second life to its double-deck trains through modernization. In total they reuse 96%. Some parts like doors, screens and dashboards can only be reused in other double decker trains. However, other parts – like the electrics –can be used in any model of train. In total this amounts to 86%. Not all materials can be reused for trains. Ten percent of every train is recycled in other products. For example, the rubber around train windows is recycled for reuse as rubber tiles for playgrounds. The NS also supplies its used raw materials for upcycling into household products – such as bags made from seat upholstery. By the end of its modernisation project, almost 24 million kilos of materials will have been salvaged from scrap and reused, so were kept as valuable materials in the cycle. Besides the double deckers, there are many other train models ready to be phased out and reused. Ultimately, the NS wants to recycle 100% of its parts. After 40 years, NS first looks at whether they can refurbish the train, or deploy it elsewhere. For example for the Railway Museum, the fire department, or sales. 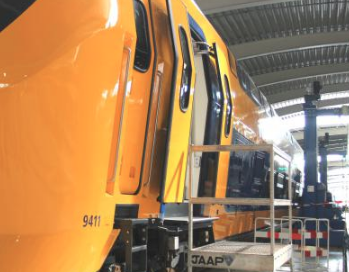 If this is not possible, we can take out the valuable parts for reuse in other trains and for the “Techniek Fabriek”, the training for mechanics. Collector items are also taken out for sale via the charity center. Then we proceed to disassembly and almost all components (97%) are converted into new valuable raw materials, with which new products are produced. Consider, for example, the fluorescent tubes, window rubbers and the metal. Until 2028, they expect to dismantle and recycle 1000 train bins with an expected weight of 57.6 million kilograms of valuable raw materials. It is not just train parts that can be reused, recycled or upcycled. These techniques can also be applied to other transport vehicles – like busses, airplanes and metros. The whole transport sector could help to expand the circular economy concept across the world.